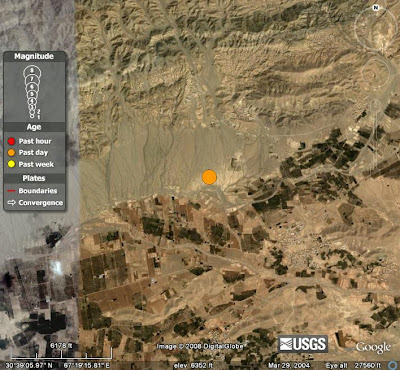 Both earthquakes had similar focal mechanisms. North-south compression (along the India/Asia collision), earth-west extension, along a strike-slip fault (again, common in Asia - see Tapponier et al., 1982, for example). 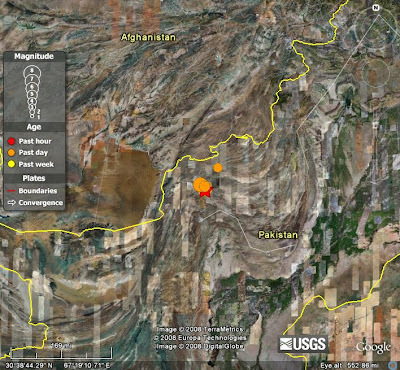 Based on the aftershock locations, I would guess the NW-striking solution is the real fault. 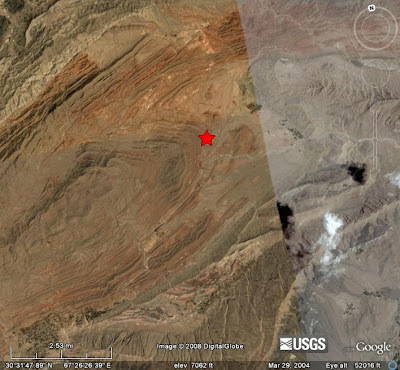 I'm curious about the relationship of the seismogenic faults to the plunging folds, though. I don't have a quick explanation... and I'm just starting to talk about faults in class this week. I would love to show the Google Earth images, but the folds show up so well on the satellite images that I should be prepared to answer questions about them in a semi-coherent way. I'm not sure how that affects the faulting, either. Reference: Tapponier, P., Peltzer, G., Le Dain, A.Y., Armigo, R., and Cobbold, P., 1982, Propagating extrusion tectonics in Asia: new insights from simple experiments with plasticine: Geology, v. 10, p. 611-616. Edit: There's discussion of landslide potential from these two earthquakes at Dave's Landslide Blog: post #1; post #2. 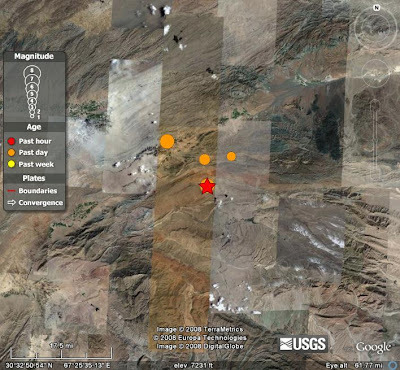 Could that 5.2 eq only half-hour before the first strong one be considered as a foreshock? What do you think? You know, I didn't actually look at the time of all the other earthquakes. I'm not a seismologist, but, well, if a little earthquake comes before a bigger earthquake (and it's on the same fault, or clearly related in some way), then I guess it would be a foreshock. I've been a silent reader of many a science blogs including yours. I have my own blog as well and I wrote something that I wish you would read, if ofcourse you have the time..
they are occured in the thrust-fold belt,so there is a plunging fold is not a question,the struct of this area must be complex,for it has normal faults thrust faults and folds.